An excellent article on Maneki Neko. Photography by Ben Jenkins. Text by Alan Pate, curator of the soon-to-open (03/13/11) Maneki Neko exhibit at the Mingei International Museum, Balboa Park, San Diego. Flickr Maneki Neko (Lucky Cats). Lots of Maneki pix & a group devoted to Maneki's. A charming new children's book for all ages. Written by Susan Lendroth. Illustrated by Kathryn Otoshi. Published by Shen's Books, Walnut Creek, CA. $17.95, Hardcover. English, Ages 4-8. 9.5 x 9.5, 32 pages, Full Color. ISBN: 9781885008398. May be purchased through Shen's website or thru Amazon. Micha's wonderful site-full of Maneki Neko info, a very interesting collection, Micha's artwork, links & more. A linked set of Manekineko websites. Sharon Hope Weintraub's "My Maneki Neko Page"
A very nice collection of older-style Manekinekos to look at. One of the best Maneki-Neko selections on the Net. A search for "neko" or "lucky cat" will reveal MN's galore! Japanese gifts including MNs. They also have antique & artist-edition Nekos for sale -- See next box. All sorts of artwork, jewelry, & knick-knacks -- most with a cat theme -- many with a Maneki Neko theme. Beautiful work & friendly people. Other contact/gallery information: threecatsgraphics@yahoo.com and www.threecatsgraphics.etsy.com and twitter.com/3catsgraphics/ and facebook.com/threecatsgraphics/ and en.dawanda.com/shop/3catsgraphics/ and www.zazzle.com/3catsgraphics/ and 3kittiesjewelryandart at eBay and www.myspace.com/threecatsgraphics/. Of all the Maneki Neko sellers on eBay, I believe that I've known of Steve, aka "ssc4tansu", the longest. (He joined eBay in 1998, about 8 mos before me.) He specializes in Japanese items &, since he imports from Japan but ships from CA, his wares can be real bargains. Lots of interesting things to look at! A very helpful list of cat shops, by location, within the U.S., Canada, & also Germany. A porcelain and ceramics reference site. Here there be pottery marks! WebRing.org's directory of "Japan Ring" member websites. A very cool, California-based, little-bit-of-everything-Japanese web which sells all kinds of stuff & also offers freebies, downloads, & interesting links. Dedicated to Kutani porcelain, with a photogallery of Kutani markings. Converts money from one form of currency to another. The place to find out how much that Japanese Neko is really going to cost you. This is one of the handiest sites on the web. Original MN graphics here. And lots & lots of other neat cat stuff, too! Three Maneki Neko 3-D designs to print out & put together. I've got to try this!. Over 100 interlinked websites devoted to cat collectibles of all kinds. A cat-collectors organization with a good newsletter. A non-profit Memphis based cat shelter and rescue group, for which I'm the official webmaster. [Hi, Barbara! Hi, Larry!] I appreciate the opportunity to give something back to the world and to be friends with these wonderful people. An amazingly funny catpix site! You will never be the same after looking at this. Yes, it's THAT GOOD !!! LOL! Japan-based errand service -- There it is! Amy Chavez writes a weekly humor column for the "Japan Times". Its subject is Japanese culture as seen through the eyes of an outsider. She also highlights Japanese words & pronunciations that relate to the topic of the week. Highly recommended -- Learn something and laugh at the same time! If you have or know-of a Maneki-Neko site that should be on this list please email me at donaldmoon@aol.com. And if you collect or are interested in Maneki Nekos, you're invited to join our email community at http://groups.yahoo.com/group/manekinekocollectors. www.home2cats.org is a nonprofit cat rescue & sanctuary in Memphis, TN, USA. I am very excited and pleased to introduce Cat Tails of Rescue! Cat Tails of Rescue is a collection of 25 stories of some of the wonderful animals that have touched our lives at Home 2 Cats Rescue/Shelter in Memphis, TN. Due to lack of space in our newsletter, "The Scratching Post", we have only been able to share short versions of some of our rescue stories. LAMA Books has generously donated the cost of publishing this book. 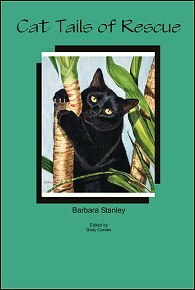 All proceeds from the sale of this book will go to Home 2 Cats to improve the lives of animals and to educate the public. With LAMA Books so generously donating the publishing cost, we are able to offer Cat Tails of Rescue at an incredible price of $5 (plus shipping, if required)! I hope the rescue stories in Cat Tails of Rescue provide enlightenment at what can be accomplished and provide inspiration to you, the individual, to become involved in rescue efforts for animals in need. Please support our rescue efforts and order your books today!